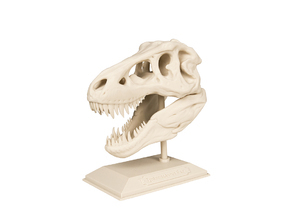 Fantastic model of a T-rex skull. Printed in white PLA and 'painted' with very little brown and yellow watercolor paint, mixed with mud from the garden. Bed: Plain glass with Sorbo gluestick.